"The sweet, minty sauce makes these carrots just a bit different. Even my husband, who says he doesn't like carrots, came back for seconds!" Place a steamer insert into a saucepan, and fill with water to just below the bottom of the steamer. Cover, and bring the water to a boil over high heat. Add the carrots, recover, and steam until just tender, 2 to 6 minutes depending on thickness. Drain carrots. Heat the butter in a skillet over low heat. Stir in the carrots, brown sugar, honey, and mint. Continue to cook and stir until the sugar is dissolved, 2 to 3 minutes. The mint added a taste that was delightful to my family. Mmmm this was good. Definitely a keeper!! Quick, easy, and something different. 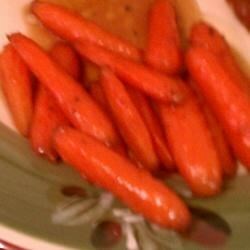 This is a great recipe for carrots.